Have you been looking for keto salmon dinner recipes? 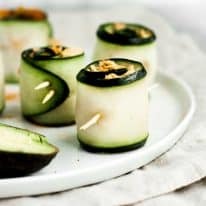 What about easy keto dinner recipes for the family? If you love anything salmon, then you will absolutely love my crispy parmesan dill salmon recipe! This is the perfect keto salmon dinner recipe you’ve been searching for. A fantastic source of lean protein, everyone I know LOVES salmon! When flavors like parmesan and dill are added to the mix, it tastes even more incredible! 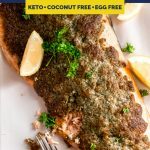 This keto, low-carb, gluten-free, grain-free, nut-free, egg-free, coconut-free, sugar-free, and primal crispy parmesan dill salmon recipe is about to serve as a fantastic treat to your tastebuds. 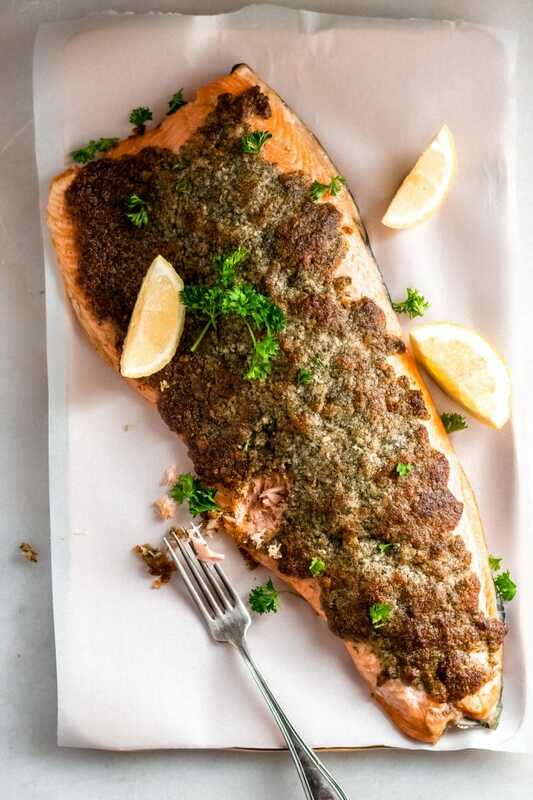 I absolutely LOVE this crispy parmesan salmon because it is JAM-PACKED with flavor while remaining totally keto-compliant. I am confident that whether you follow a ketogenic diet or not, you will love this salmon too! Here at Real Balanced, ALL of my recipes are low-carb and ketogenic-friendly! This crispy parmesan salmon is totally compliant with the keto lifestyle as well. 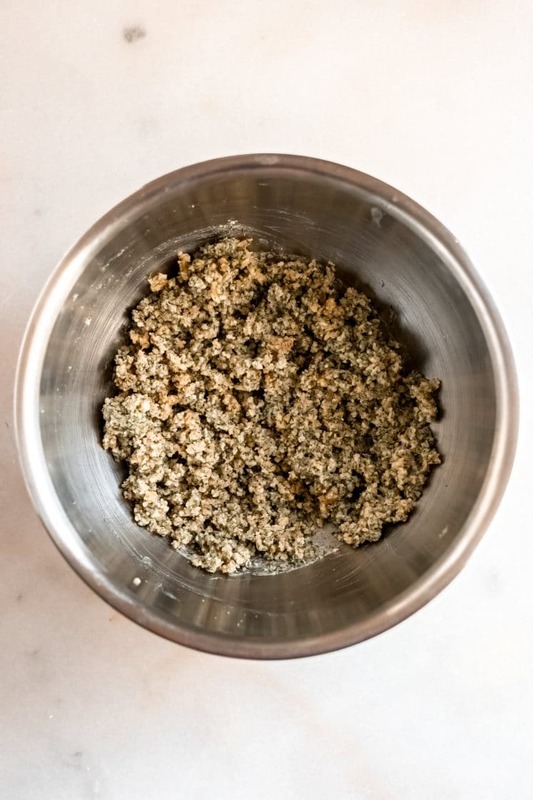 Since bread crumbs are carb-heavy, I had to come up with an alternative coating that tasted good and worked well with the other flavors in this salmon dill recipe. To achieve this, I implemented pork rinds! Pork rinds are delicious and work extremely well with this dish. Most importantly, they contain ZERO carbs! It is a win-win! One of the best parts about this salmon is that it requires a minimal time commitment. This really is a quick dinner idea! Including ALL prep and baking time, this salmon is ready to enjoy in less than 30 minutes! To be exact, from start to finish, it only requires 25 minutes of your time. How awesome is that?! 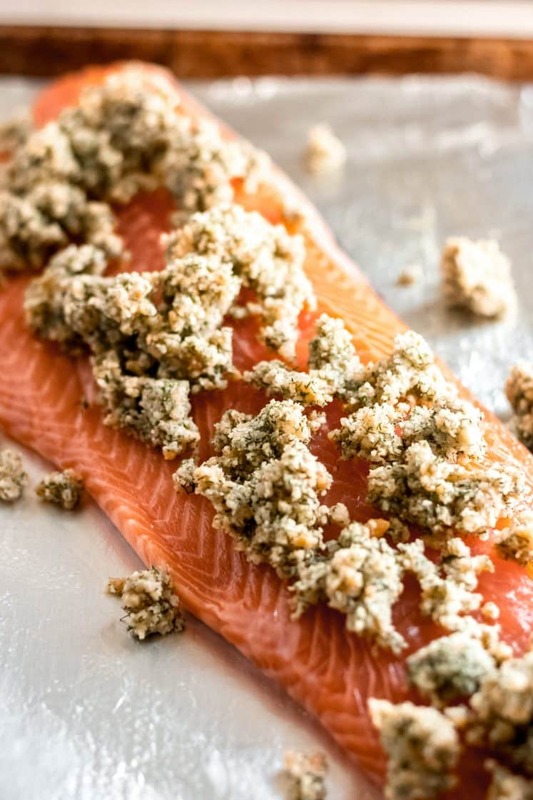 This salmon tastes absolutely incredible thanks to carefully selected ingredients. Dill, pork rinds, butter, garlic, and parmesan are some of the main ingredients in this recipe. These ingredients are delicious and also contain a bunch of various health benefits! Salmon: Salmon is known to be one of the healthiest types of fish, and for good reason. Salmon is delicious and contains a TON of benefits! To start, salmon is full of omega-3 fatty acids, protein, B vitamins, and potassium. In addition, eating salmon can also help control weight as well as combat heart disease and inflammation. Dill: Dill is a SUPER beneficial herb that is full of nutrients including phosphorus, iron, magnesium, and potassium! Dill helps to lower cholesterol, is a great antioxidant, and has been shown to have anti-cancer properties! Garlic: Garlic is a total powerhouse. Technically classified as a vegetable, garlic contains manganese, Vitamin B6, calcium, potassium, AND iron. It fights sickness, reduces blood pressure, aids in digestion, and lowers the risk of heart disease. Per 100g of raw salmon, there are 131 calories and 0 grams of carbs, making it a perfect protein option to add into your meal rotation! Salmon is also a nutrient-powerhouse as it contains vitamin D, niacin, and vitamin B12. You will love this absolutely delicious salmon recipe! Each recipe yields 8 servings. For the ultimate keto-friendly meal, you can pair this with yummy Real Balanced sides like Keto Roasted Radishes, Warm Bacon and Egg Salad, Bacon Green Bean Casserole or Buffalo Deviled Eggs! If you like salmon, you will LOVE salmon with parmesan! Preheat oven to 450 degrees and line baking sheet with foil. Generously coat foil in nonstick cooking spray before placing salmon skin-side down. Then, in a mixing bowl, whisk together pork rinds, parmesan cheese, dried dill, salt, and pepper. 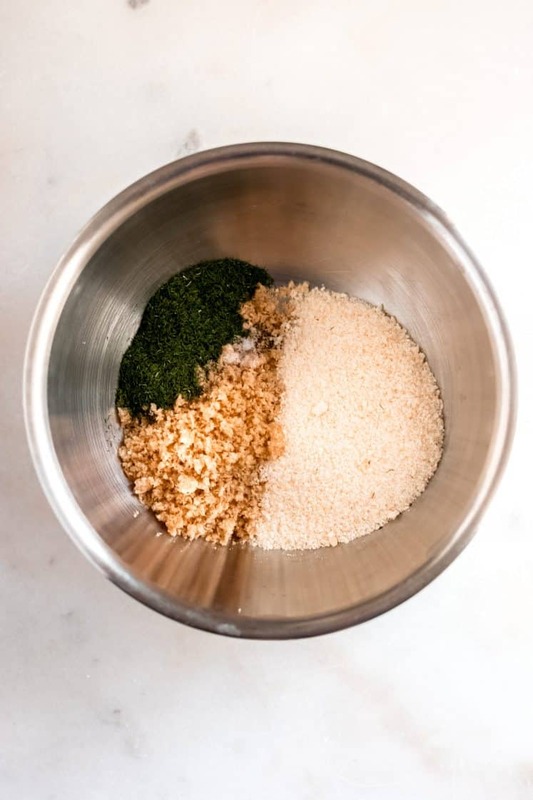 …and with an electric mixer, mix together until are ingredients are well-combined. 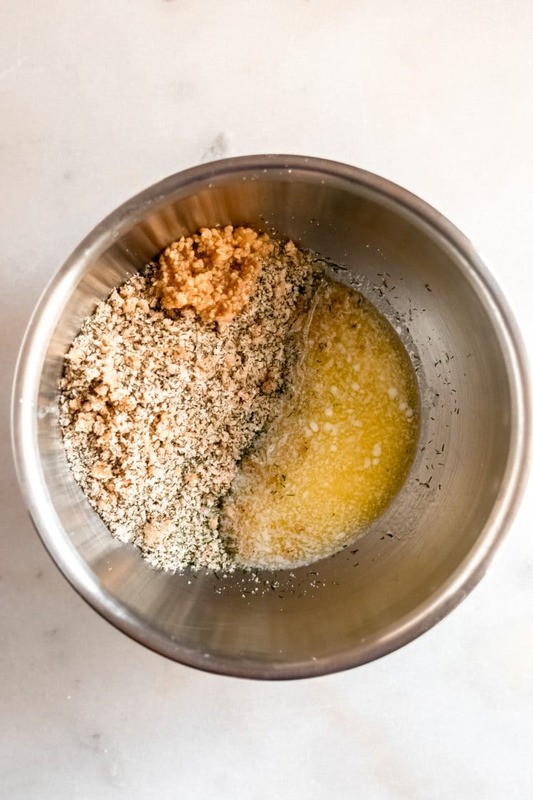 …then with your fingers, gently massage the mix onto the salmon. Transfer baking sheet to oven and bake until crust of salmon is golden and salmon reaches internal temperature of 120 degrees, about 15 minutes. Turn on oven broiler, transfer baking sheet to top oven rack, and broil until parmesan atop salmon is golden and crispy, about 1 minute. Serve salmon hot with lemon wedges and a sprinkle of fresh parsley. This parmesan salmon recipe is compliant with so many diet types! 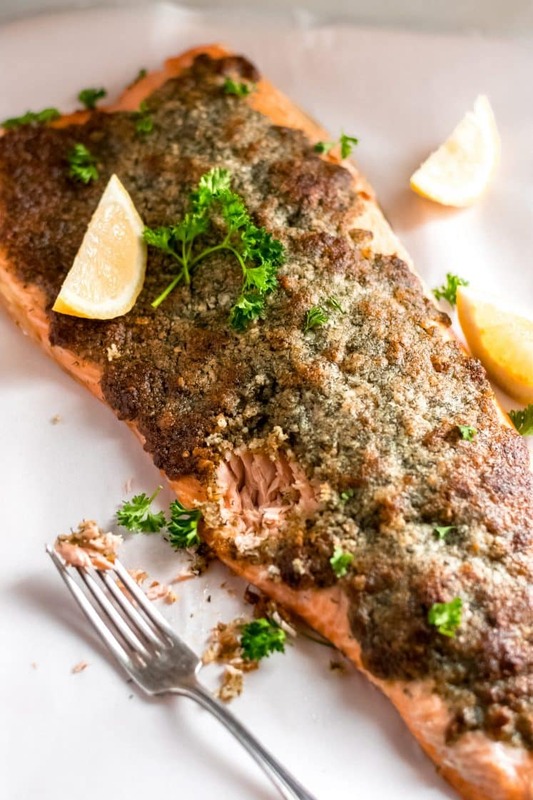 Keto and Low Carb: This parmesan salmon recipe is PERFECT for those on a keto or low carb diet, as each serving only contains 1.4 net carbs. 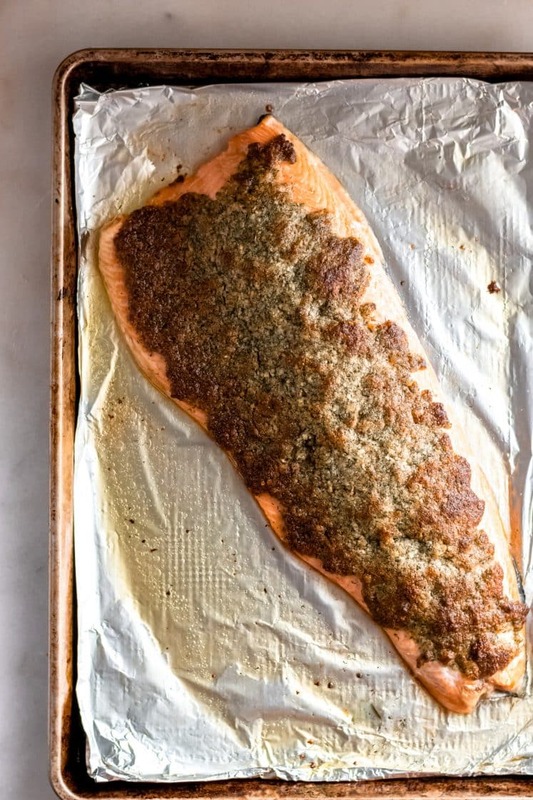 Primal: This baked salmon recipe adheres to primal diet guidelines. Gluten-Free: This recipe is completely gluten free thanks to the absence of wheat, barley, rye, and other gluten-containing products. Grain-Free: There are no grain-containing products used within this recipe. Nut-Free: This parmesan salmon is free of peanuts and tree nuts and is safe to consume for those with nut allergies and intolerances. Coconut-Free: This recipe does not use coconut products. 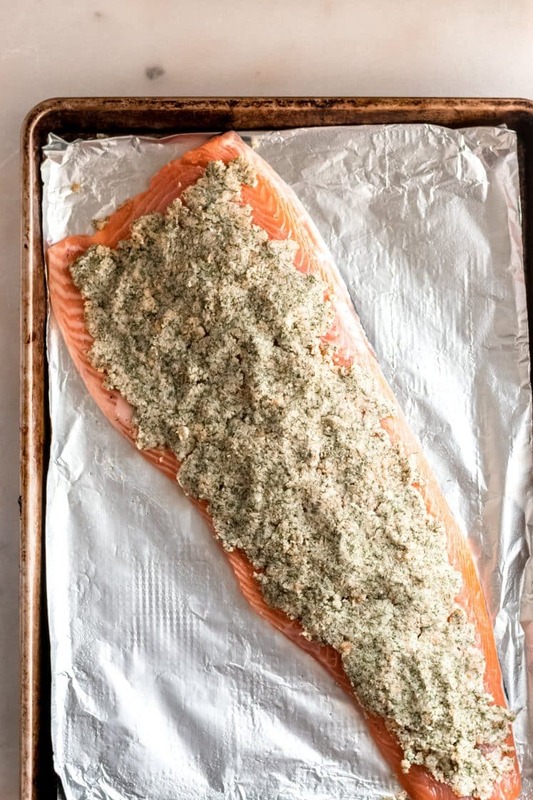 Egg-Free: No eggs are in this crispy parmesan dill salmon recipe. Sugar-Free: This recipe does not require added sugar or sweeteners. Looking for more Real Balanced dinner ideas? If you are in need of some additional dinner ideas, I have you covered! Check out these yummy recipes to help you plan for your week ahead! Have you been looking for keto salmon dinner recipes? 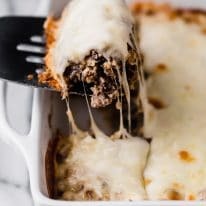 What about easy keto dinner recipes for the family? 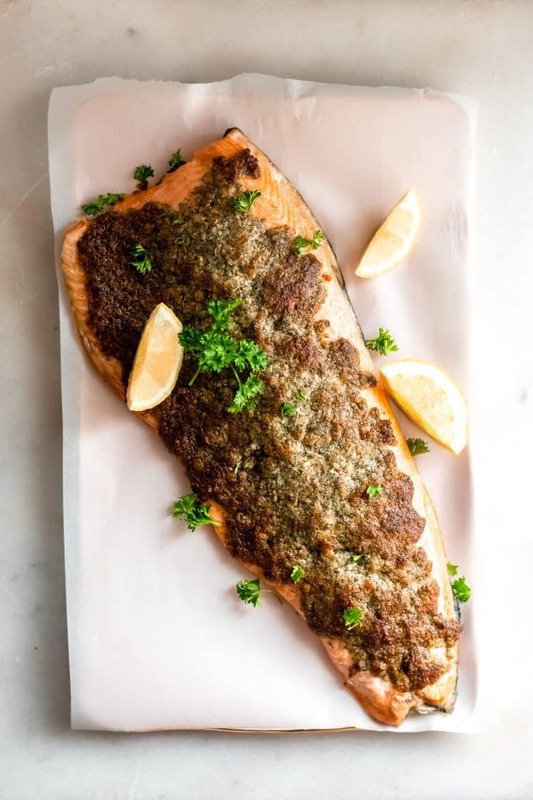 My crispy parmesan dill salmon recipe is the perfect keto salmon dinner recipe. Preheat oven to 450 degrees and line baking sheet with foil. Generously coat foil in nonstick cooking spray before placing salmon skin-side down on pan. In a mixing bowl, whisk together pork rinds, parmesan, dill, salt, and pepper. 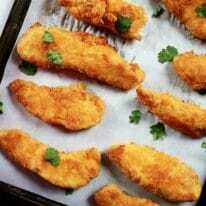 Add melted butter and minced garlic, and, using an electric mixer, mix together until are ingredients are well-combined. Pour mixture atop salmon and, using fingers, press and massage mixture into salmon. 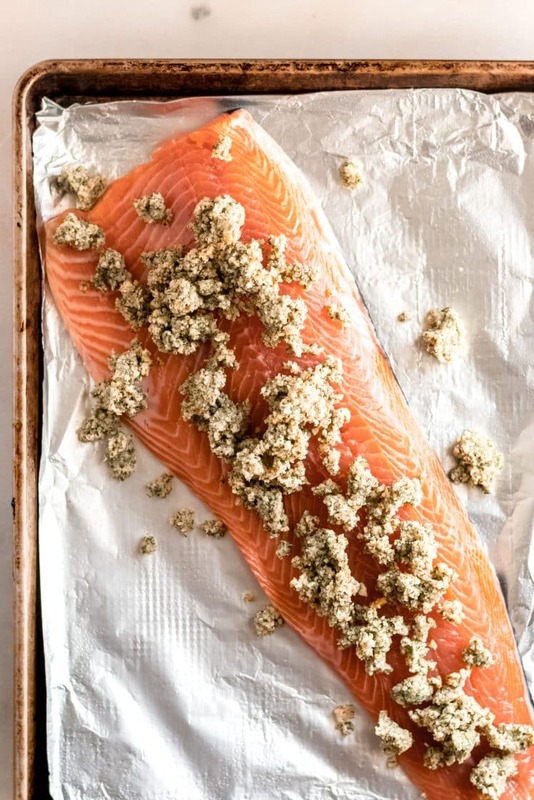 Transfer baking sheet to oven and bake until crust of salmon is golden and salmon reaches internal temperature of 120 degrees, about 15 minutes. Turn oven broiler on, transfer baking sheet to top oven rack, and broil until parmesan atop salmon is golden and crispy, about 1 minute. Serve salmon hot with lemon wedge and sprinkle of fresh parsley. Pork Rind Substitution: There is not a viable substitution for pork rinds so, if you choose not to use them in this recipe, you can either replace them with grated parmesan at a 1:1 ratio, or you can altogether omit them. If you choose to omit them, note that the salmon will not be as crispy as the original recipe intends. 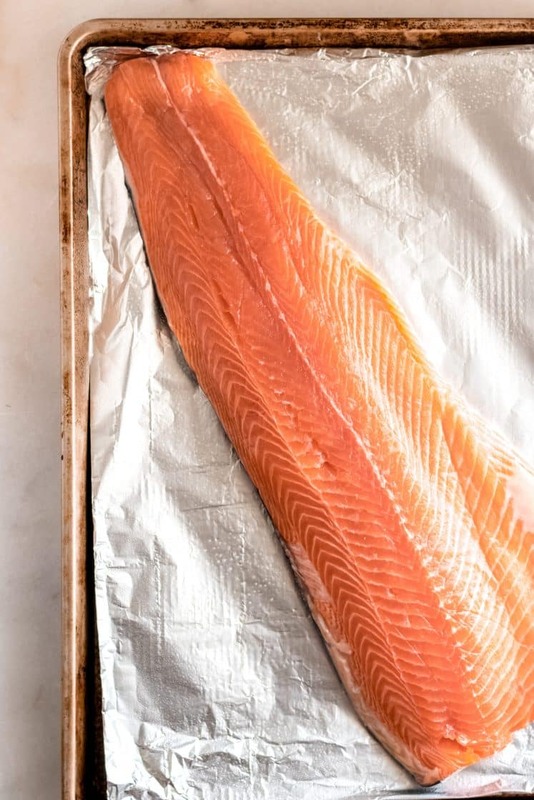 Storage: Store salmon in an airtight container in the refrigerator and eat within 3-4 days. Reheating Salmon After Refrigeration: Preheat oven to 275 degrees and line baking sheet with foil. Coat foil in nonstick cooking spray. Place salmon skin-side down on pan and bake until salmon reaches internal temperature of 120 degrees. The bake time may be upwards of 15 minutes (bake time is dependent on how cold the refrigerated fish was).